The article below originally appeared in Seattle Yoga News. There is a myth that one must be Hindu or Buddhist to practice yoga. The truth is that yoga predates many of the religions that have incorporated yoga techniques. In the Middle Ages (500- 1500 BC) numerous variations and practices stemmed from the common Hatha yoga practice. Bhakti yoga is one stem. It focuses on surrendering to God. Unlike other types of yoga, Bhakti is a spiritual journey and a devotion to the divine. This often confuses followers of Christ, and makes them question practicing yoga. Hindus incorporated Bhakti yoga and other yoga techniques into their religious practices. Other religions have done the same thing, however, because Hinduism is the most popular religious group to incorporate and use yoga, many believe that yoga is Hinduism, and that you have to worship other gods or believe other philosophies in order to practice yoga. This would be like saying you can’t read the Bible if you are not a Christian. Of course, the Word of God and Jesus is inclusive and for everyone, just like the practice of yoga. Let’s get real. You do not have to be Brazilian to do Zumba, you do not have to be Buddhist to practice martial arts and you do not have to be Hindu to practice yoga. A person of Christian faith no longer has to fear doing yoga. Hearsay and opinions about Christians practicing yoga should not come from a preacher’s mouth, especially one who has never experienced Christian yoga, and it should not come from an author of an article such as this, or from the mouth of a friend. Rather, I encourage you to look to your True North which is the Word of God. Don’t let a myth, opinion or anything else come into your mind and spirit without checking your Bible. Dive into scriptures such as Mark 12:30 that declares, “love The Lord with all of your heart, all of your mind, all of your soul and all of your strength.” Scriptures declare worship and adoration with the “whole self” repeatedly. It isn’t the truth that will set you free, it is the truth that you knowthat will set you free. God leads and guides seekers into all truth. If you believe that God created the Heavens, the Earth and everything above and below, then you would believe that yoga is a gift from God. Your yoga practice, centered on Christ, can be your worship in action, your faith and prayers in motion. Inhale Him, exhale you. I double dog dare you. Yoga is simply defined as union, unite, or to be yoked. It is a mind, body, and spirit practice, whether you are or are not religious or spiritual, you can practice the wonderful and ancient gift of yoga. There is a myth that Christians cannot practice yoga or that you must be Hindu or Buddhist to practice yoga. 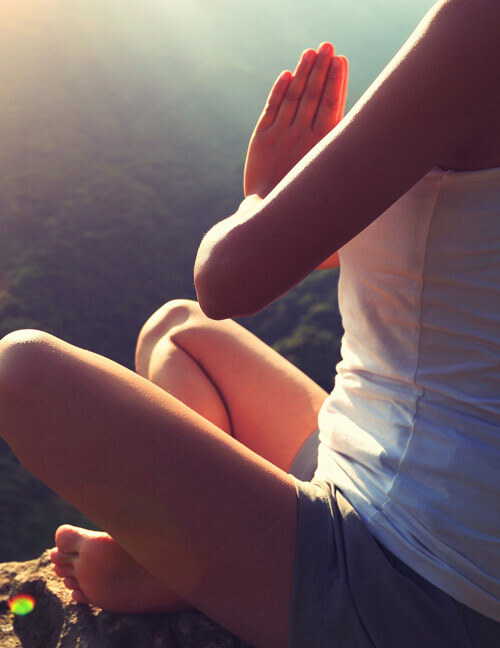 The truth is that yoga predates religion, but religious people have practiced yoga. As a Christian, no matter what we choose to do to honor our temples the Lord has given us, we take our everyday comings and going to glorify Him. When we take care of ourselves we are honoring and glorifying Christ. Yoga is not a religion. Aspects of yoga have been incorporated into many groups, including religions, however in itself it is not a religion, nor do you have to be religious to practice yoga. Some Eastern philosophies have used the practice of yoga, meditation, times of stillness to reflect on self enlightenment or a source they believe in. On this note, Meditation is defined as Contemplation. No matter what we are practicing our meditation can be on anything or anyone. In YogaFaith we turn our thoughts and hearts toward Christ. We meditate on Him and His word just as it declares throughout the Bible to meditate on His word day and night. It is a matter of intentionality with anything that we do. What are you setting your heart and mind to at any given moment. To set you mind, heart, and spirit on the Lord for an undistracted length of time to find stillness, peace amongst the chaos to hear His still small voice, or moving and flowing to worship music as you completely surrender with your all and worship with all of your might, all of your being, all of your spirit, and all of your mind. (See Mark 12:30) I do not know how else to translate the word of God declaring so many times that we are to worship with our whole self. In Him we move and we breath and we have our being. Acts 17:28. To experience the Holy Spirit and the powerful presence of God while you surrender and move in Him is very difficult to describe. It must be experienced. You do not have to be Brazilian to do zumba, you do not have to be Buddhist to practice martial arts, and you do not have to be Hindu or any other religion to practice yoga. Focus on the True North. The Word of God. Don’t let a myth, opinion, or anything else [ever] come into your mind and spirit without checking with the Spirit. He will lead and guide you into all truth. Yoga is a gift from God. It is our worship in action. Prayer in motion. And so much more!